230 Beacon is located on the north side of Beacon, between Clarendon and Dartmouth, with 228 Beacon to the east and 232 Beacon to the west. 230 Beacon was built ca. 1864 for dry goods merchant and cotton broker William Walker Tucker. He and his wife, Susan Elizabeth (Lawrence) Tucker, lived at 98 Beacon. William Tucker purchased the land for 230 Beacon on June 3, 1863, from the Boston and Roxbury Mill Corporation. His business partner, George Phineas Upham, purchased the land for 226 Beacon and 228 Beacon on the same day. Click here for an index to the deeds for 230 Beacon. On May 13, 1864, William Tucker transferred the property into his wife’s name. On April 1, 1865, 230 Beacon was purchased from Susan Tucker by John Wooldredge. He was a shoe manufacturer in Lynn, where he lived with his wife, Emily (Dunbar) Wooldredge. On September 11, 1865, 230 Beacon was acquired from John Wooldredge by Harriet (Webb) Gray, the wife of cotton buyer Gorham Gray. They previously had lived at 610 Tremont. By 1867, they had moved to 107 Mt. Vernon. On August 15, 1866, 230 Beacon was acquired from Gorham Gray by dry goods commission agent Charles Henry Joy. He and his wife, Marie Louise (Mudge) Joy, made it their home. They previously had lived in Lynn. In 1870, the Joys were living elsewhere and 230 Beacon was the home of John Murray Glidden and his wife, Anna Maria (Warren) Glidden. They had married in October of 1869 and 230 Beacon probably was their first home together. Prior to their marriage he had lived at 1 Marlborough with his parents, William Taylor Glidden and Katharine Cottrell (Glidden) Glidden. 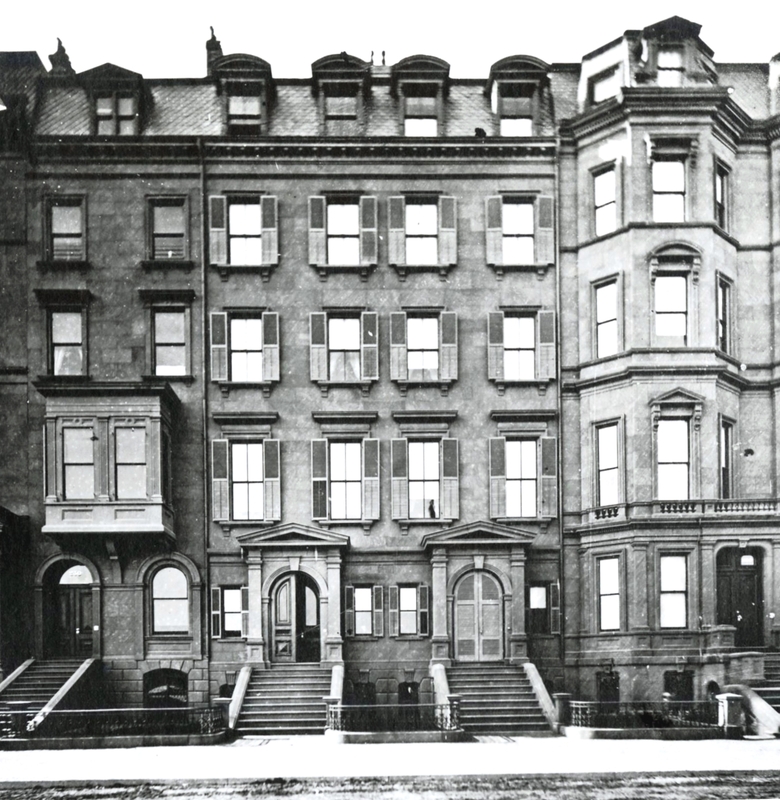 By 1871, the Gliddens had moved to 1 Marlborough to live with his parents and the Joys were living at 230 Beacon once again (their son, John Algeron Joy, was born there in December of 1871). By 1872, the Joys had had moved to 86 Marlborough and the Gliddens were living briefly at 230 Beacon once again. 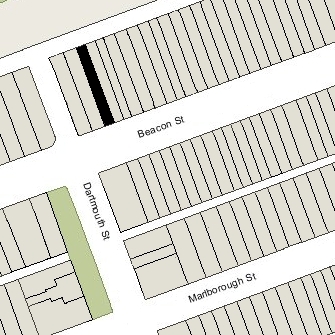 They moved soon thereafter to 107 Marlborough (they are listed at both addresses in the 1872 City Directory). On April 1, 1873, 230 Beacon was acquired from Charles Joy by Elizabeth Jones (Chadwick) Whittier, the wife of Charles Albert Whittier. They previously had lived at 5 West Cedar. Charles Whittier was an investment banker and broker with the firm of Lee, Higginson & Co. He had served in the US Army during the Civil War, and was brevetted a Brigadier General. In 1898, at the outbreak of the Spanish-American War, he offered his services again, and was appointed Inspector General, accompanying General Merritt to the Philippines. He subsequently served as Collector of Customs in Manila for several months, and then returned to Boston. The Whittiers continued to live at 230 Beacon until about 1882, when they moved to a new home they had built at 270 Beacon. On January 20, 1883, 230 Beacon was acquired from Elizabeth Whittier by Rosamond (Lawrence) Peabody, the wife of attorney Francis Peabody and his wife. They previously had lived at 251 Beacon. Francis Peabody was known as “Francis Peabody, Jr.,” but was the son of Samuel Endicott Peabody and the grandson of Francis Peabody. 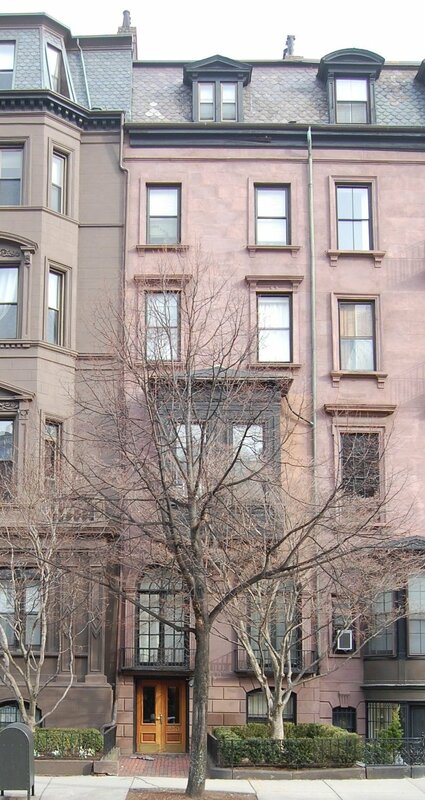 The Peabodys continued to live at 230 Beacon during the 1888-1889 winter season, but moved thereafter to 391 Commonwealth. On September 12, 1889, 230 Beacon was acquired from Rosamond Peabody by Georgianna Olivia (Davis) Taylor, the wife of Charles Henry Taylor. They previously had lived at 108 Charles Street. Charles Taylor was publisher of the Boston Globe. Between 1891 and 1893, he also served on the staff of Governor William E. Russell, with the rank of Brigadier General. 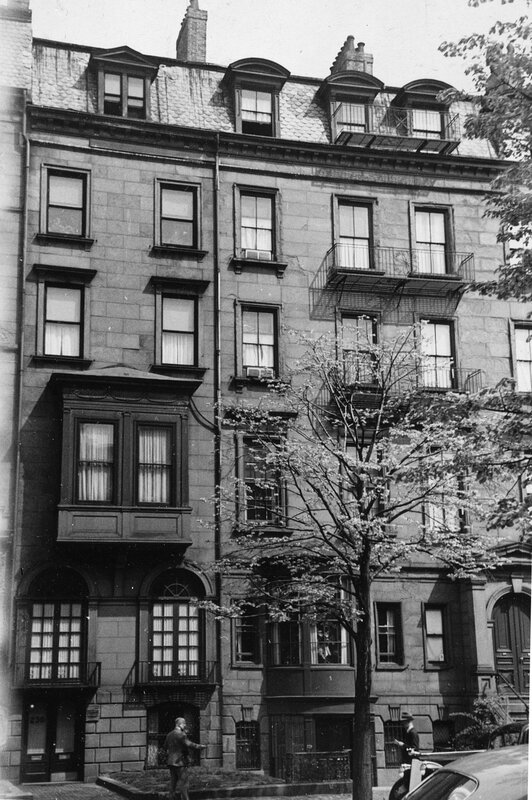 The Taylors continued to live at 230 Beacon during the 1903-1904 winter season. In 1904, they purchased and moved to 332 Beacon. 230 Beacon was not listed in the 1905 Blue Book. On December 29, 1904, 230 Beacon was acquired from Georgianna Taylor by Leonora (Lewis) Jackson, the wife of Dr. James Marsh Jackson. They previously had lived in an apartment at The Grosvenor at 259 Beacon. James Jackson was a physician and also maintained his medical offices at 230 Beacon. He died in December of 1918. Leonora Jackson continued to live at 230 Beacon until about 1923. By the 1924-1925 winter season, she was living at 3 West Cedar. In January of 1923, Leonora Jackson applied for (and subsequently received) permission to make repairs to the floor timbers on the first, second, third, and fourth floors. The repairs appear to be as a result of fire damage, but the permit application does not specifically so indicate. On June 14, 1923, 230 Beacon was acquired from Leonora Jackson by Dr. Luther Dimmock Shepard, Jr. He and his wife, Frances (Conway) Shepard, made it their home. They previously had lived at 16 Keswick. They also maintained a home at Ogunquit, Maine. Dr. Shepard was a dentist and maintained his offices at 230 Beacon. Several other dentists also had offices there with him. When he purchased 230 Beacon, Luther Shepard had given a mortgage to the Old Colony Trust Company as trustee under the will of his mother, Josephine (Bailey) Shepard. On May 7, 1942, he transferred the property to Old Colony in lieu of foreclosure. The Shepards continued to live at 230 Beacon and he continued maintain his office there until the early 1960s. On June 13, 1942, 230 Beacon was acquired from the Old Colony Trust Company by Willis Munro. Willis Munro was an attorney by training. He had given up law practice to become a forester, but later resumed practice as a trustee. A widower (his wife, Marion Beach (Bogardus) Munro, had died in June of 1935), he lived in Mattapoisett. In June of 1947, he married again, to Ruth William Bowditch. They continued to live in Mattapoisett and, by 1950, made 146 Beacon their Boston home. On January 9, 1956, 230 Beacon was acquired from Willis Munro by C. Paul Bonin and Everett A. Tisdale, and on April 6, 1956, it was acquired from them by Two Thirty Beacon, Inc., of which Everett Tisdale was the treasurer. On August 19, 1957, Two Thirty Beacon, Inc., applied for (and subsequently received) permission to remodel the property and change the occupancy from a single-family dwelling and dental office to a two-family dwelling and dental office. On January 31, 1964, 230 Beacon was acquired from Two Thirty Beacon, Inc., by real estate dealer Edward L. Britt and his wife, Ann M. (Lynch) Britt. They had acquired 228 Beacon in May of 1963, and in February of 1964, they acquired 232 Beacon. In April of 1964, Edward Britt filed for (and subsequently received) permission to combine 228 Beacon and 230 Beacon, cutting through openings in the party wall on the ground level and fourth floors. He also increased the number of units at 228 Beacon from six to seven, and increased the occupancy of 230 Beacon from two units and a dental office to eight units and a dental office. 228-230-232 Beacon changed hands and was acquired on November 21, 1968, by Snelling Robinson Brainard and David V. Harkins, trustees of the Beacon Street Improvement Trust. They also held an option to purchase 234 Beacon and, in April of 1969, acquired an option to purchase 226 Beacon. On May 22, 1972, Edward L. Britt re-acquired 228-230-232 Beacon from Richmond I. Bailen, trustee in bankruptcy for Snelling R. Brainard. On the same day, he transferred 228-230 Beacon to himself as trustee of the 228-230 Beacon Trust, and transferred 232 Beacon to himself as trustee of the 232 Beacon Trust. On April 17, 1973, Edward Britt converted 228-230 Beacon into sixteen condominium units, the Beacon Waterside Condominium.